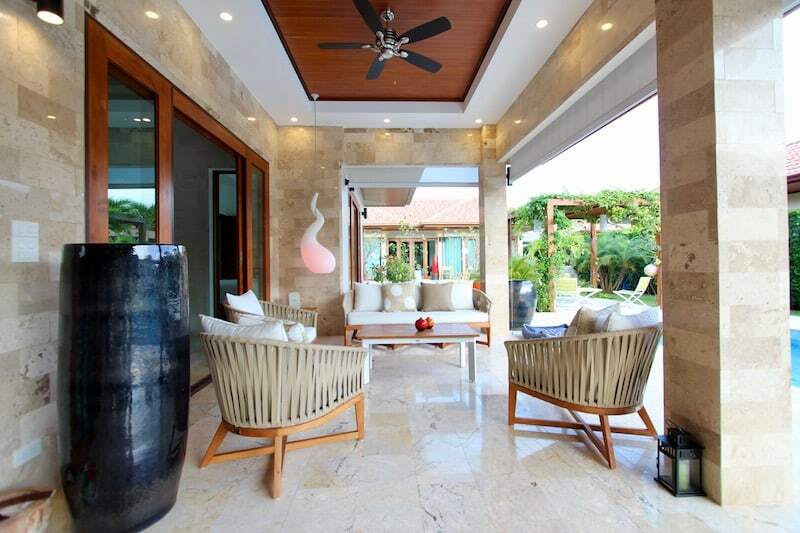 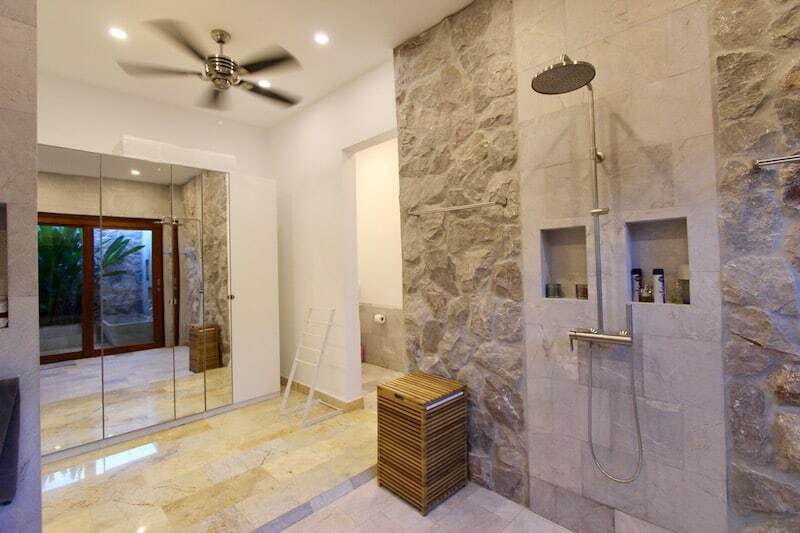 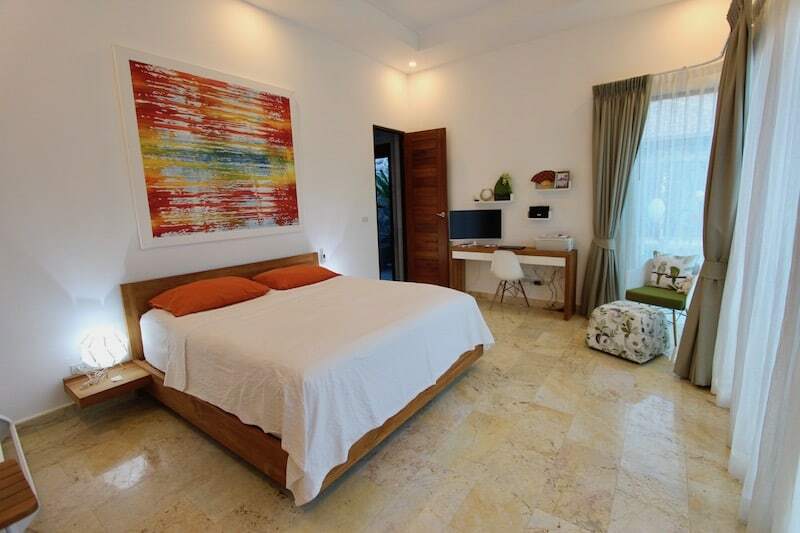 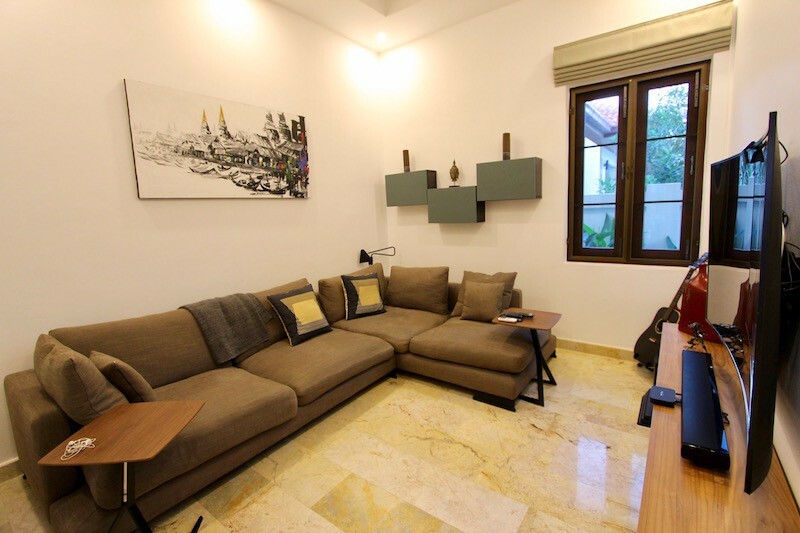 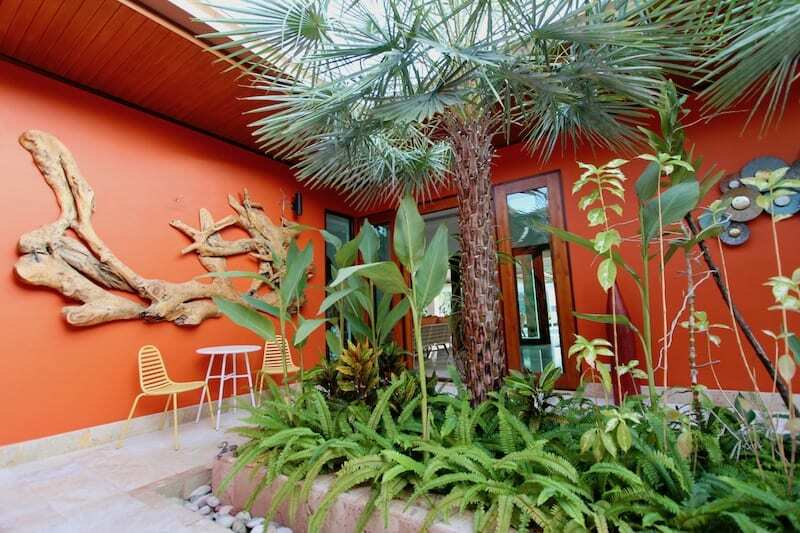 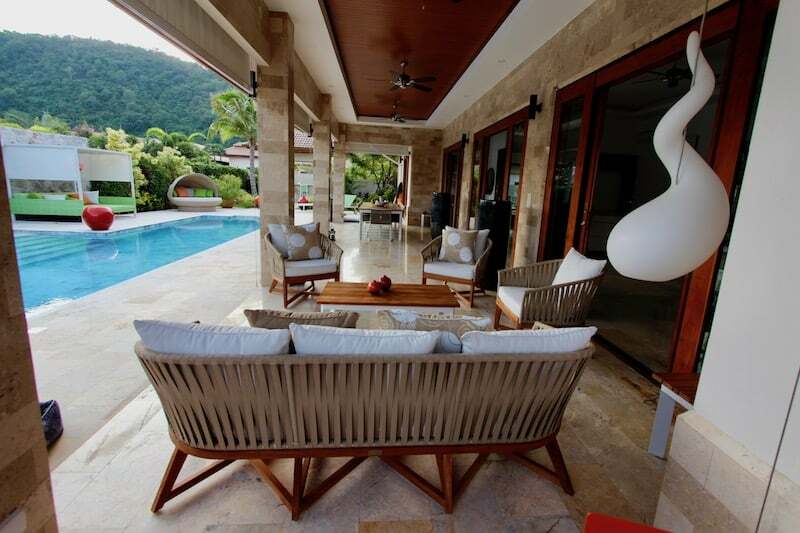 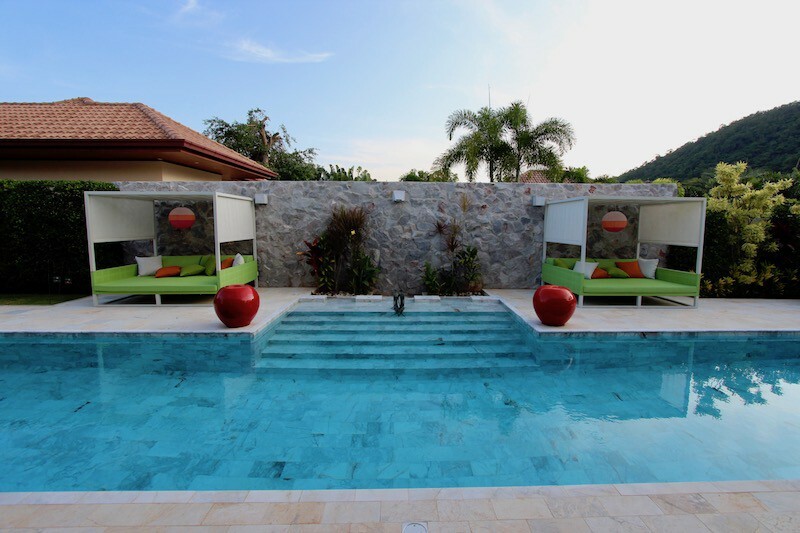 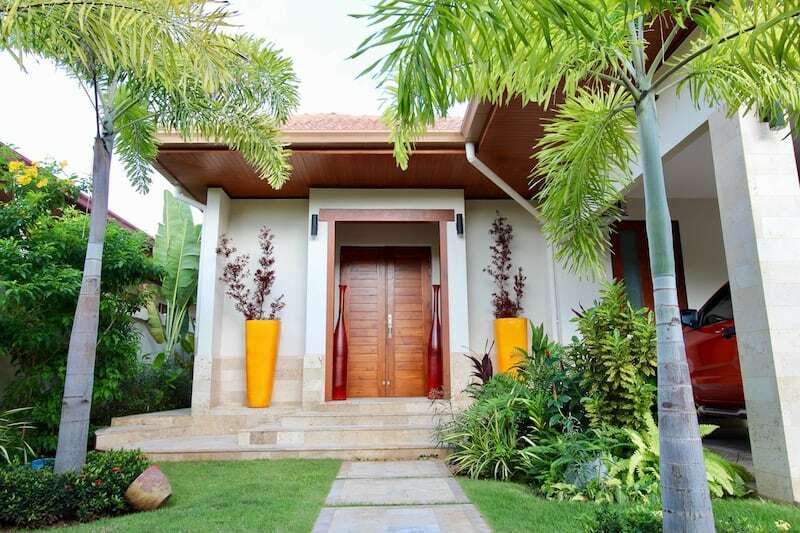 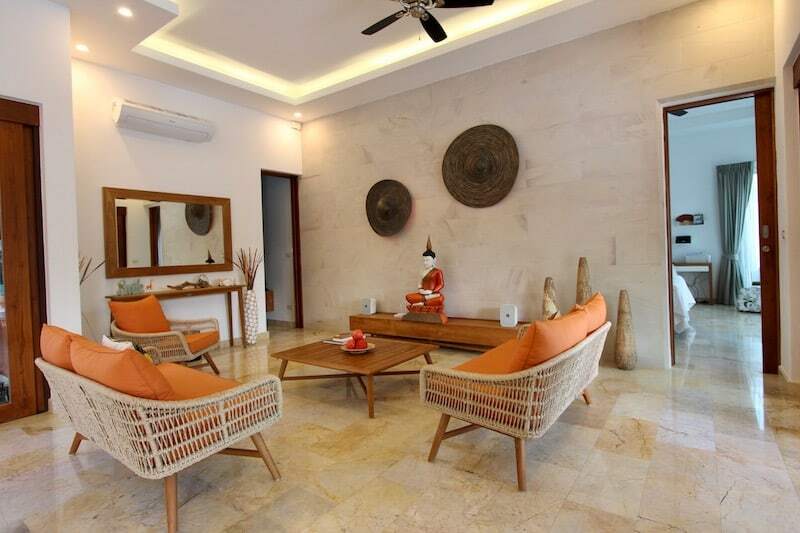 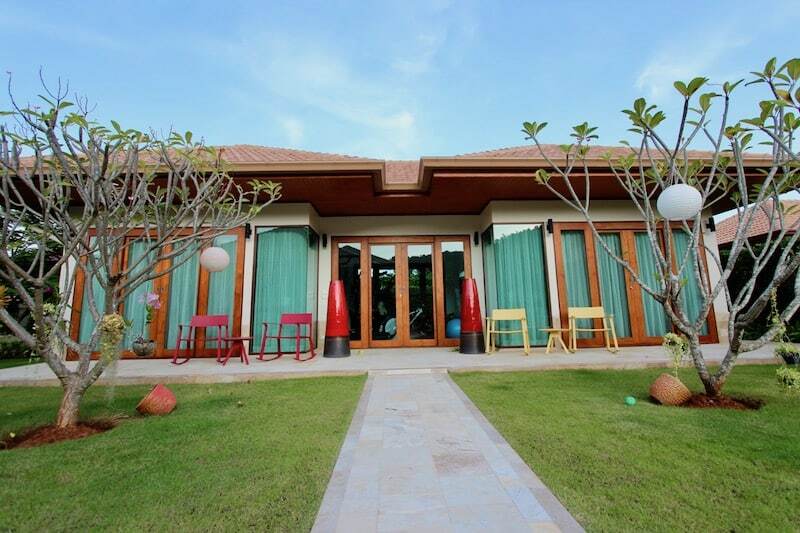 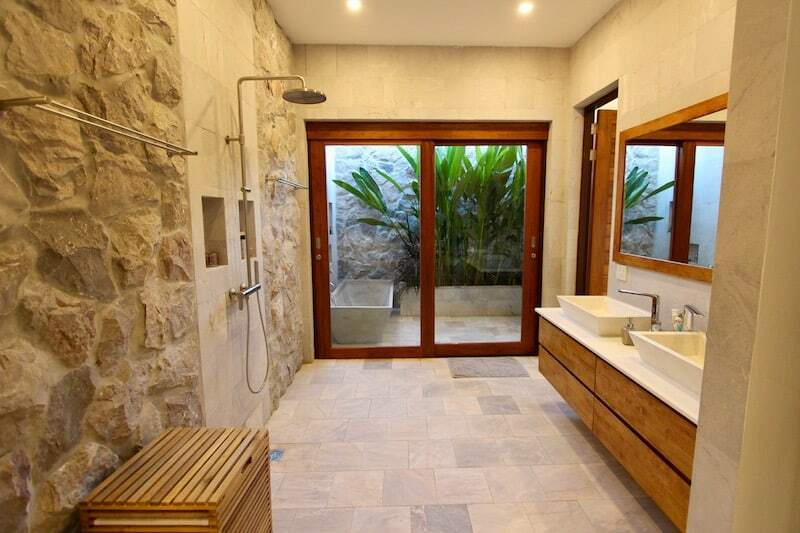 This is a stunning new home for sale in Khao Kalok, close to the beach. 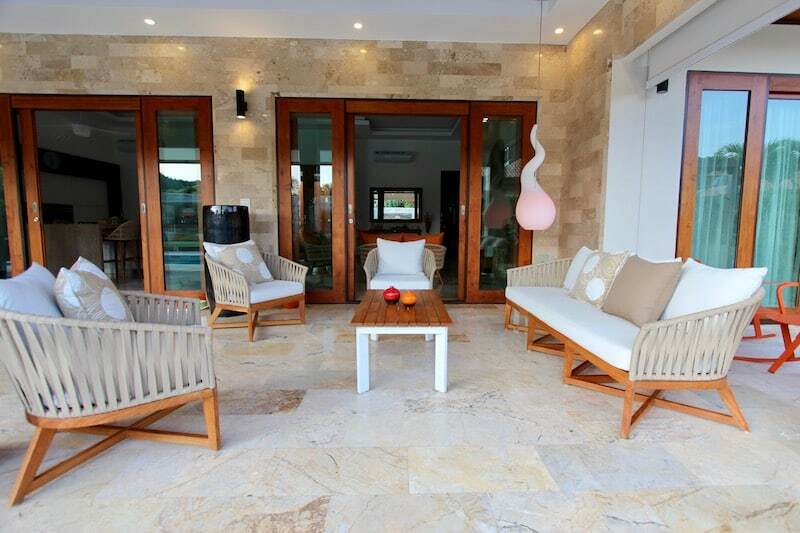 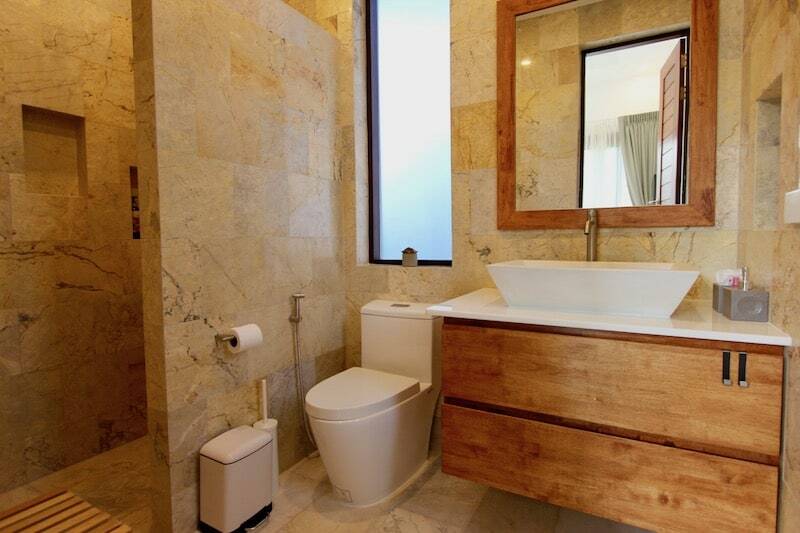 The property is in immaculate condition, and every design detail has been carefully considered. 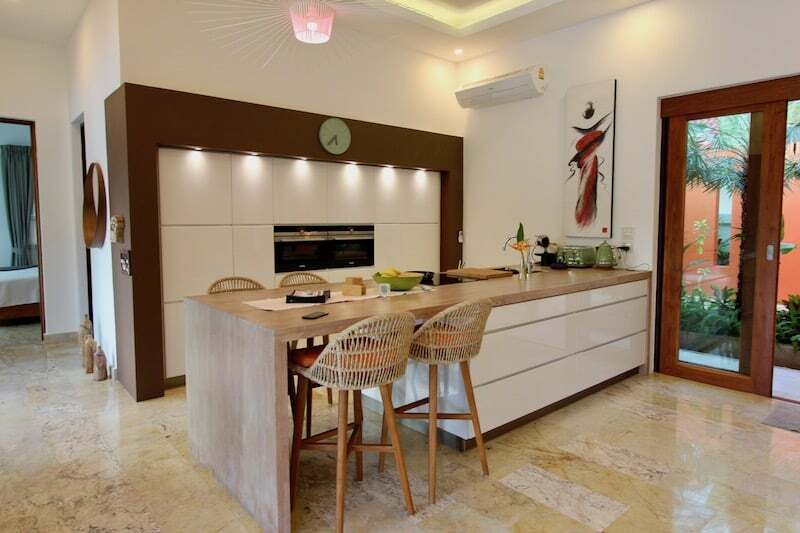 The home is within a prestigious, private development of high quality homes about 1.5 km to the beautiful Khao Kalok beach and less than 30 minutes to downtown Hua Hin. 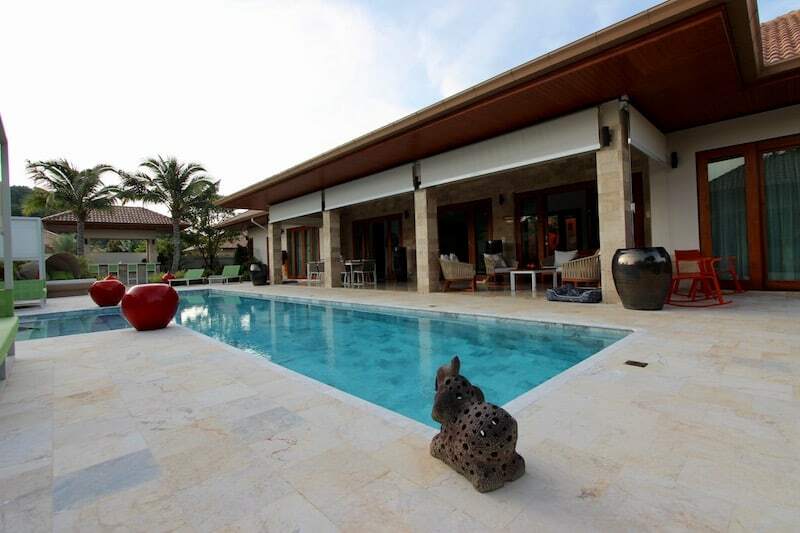 The land size is large at 1,270 m2 and is full Chanote title deed. 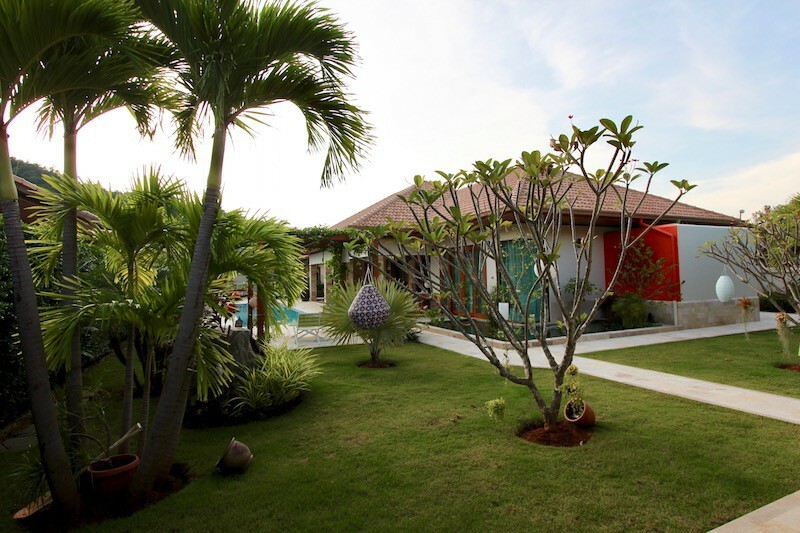 The ownership is currently leasehold, but can also be owned freehold. 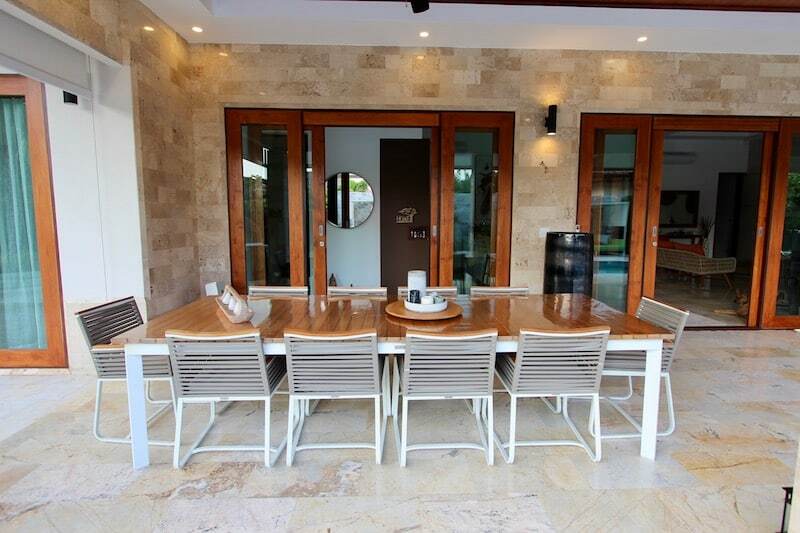 The property features a Bali style interior courtyard, a large covered terrace, outdoor BBQ kitchen and spacious living areas. 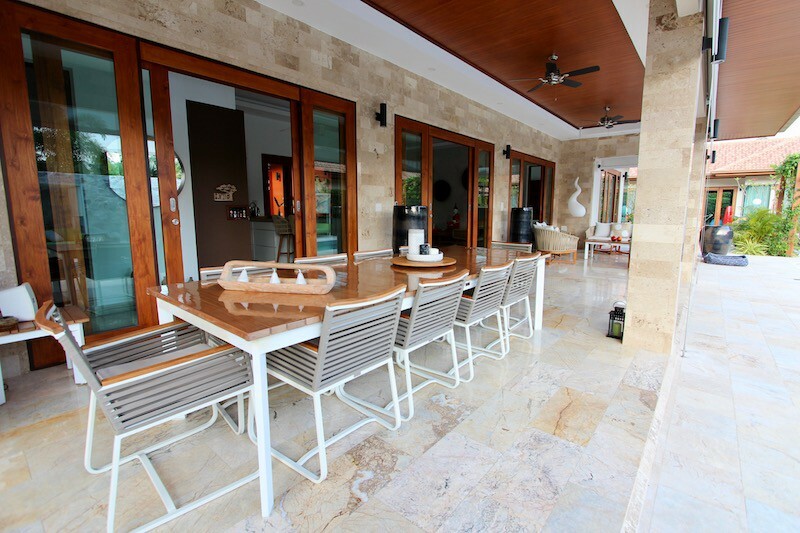 The main house has a modern kitchen with a hardwood waterfall-style island and white high gloss cabinets. 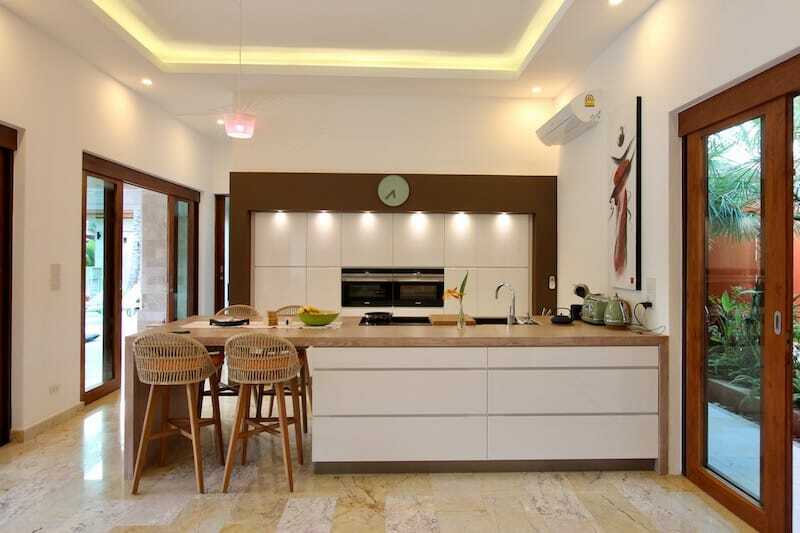 All appliances are top end, with an integrated fridge freezer and dishwasher. 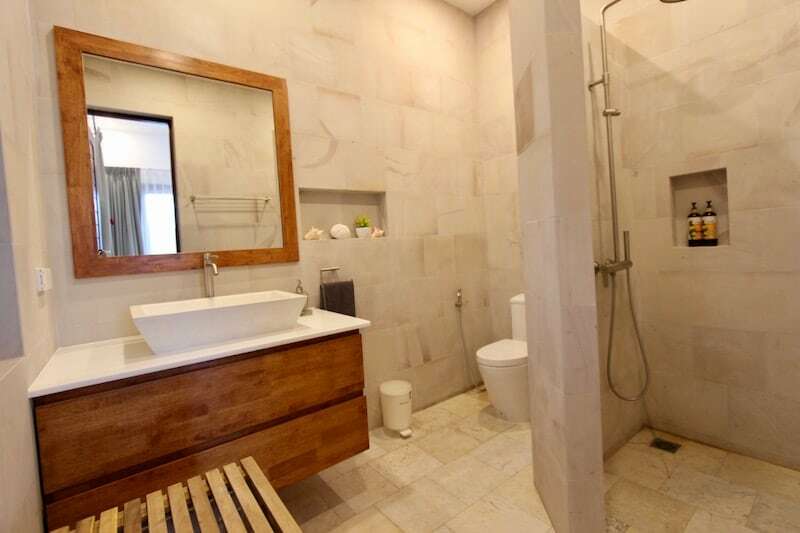 There is an additional “dirty kitchen” tucked behind the show kitchen for extra storage and prep space. 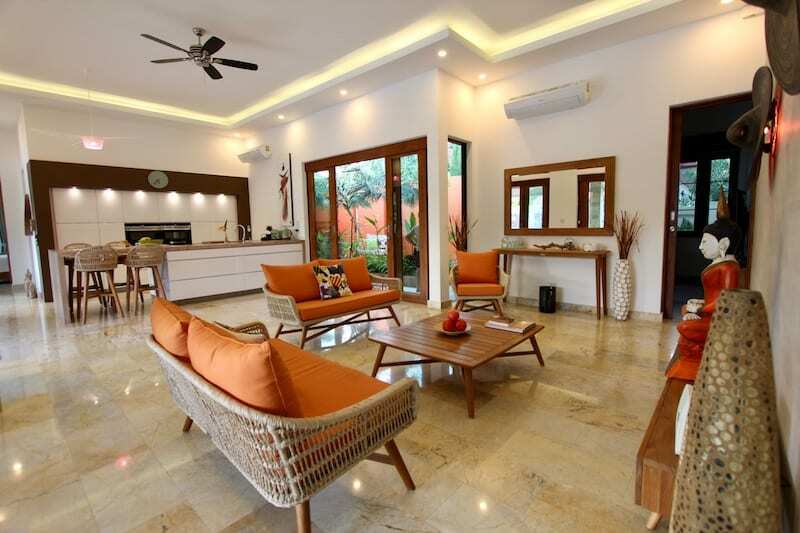 The open living room is spacious with high ceilings and tall sliding Teak wood doors, which bring in a lot of natural light and enhance the natural beauty. 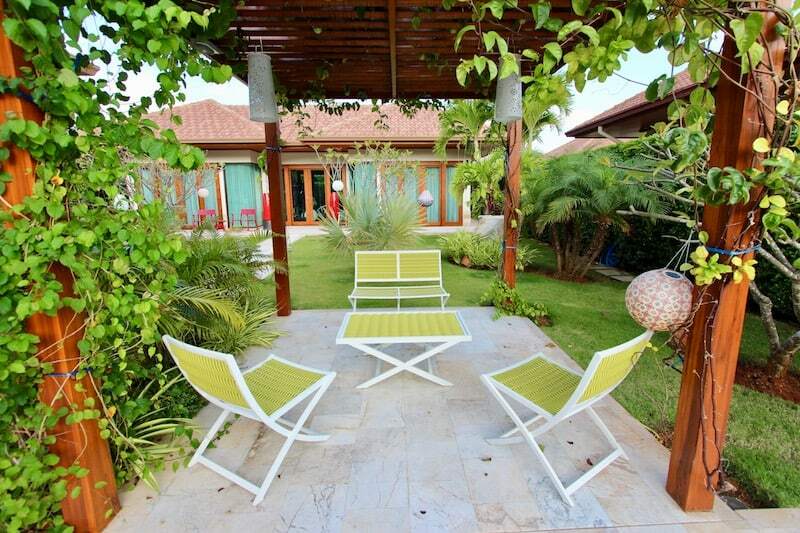 There are lovely garden views from every door and window in the property. 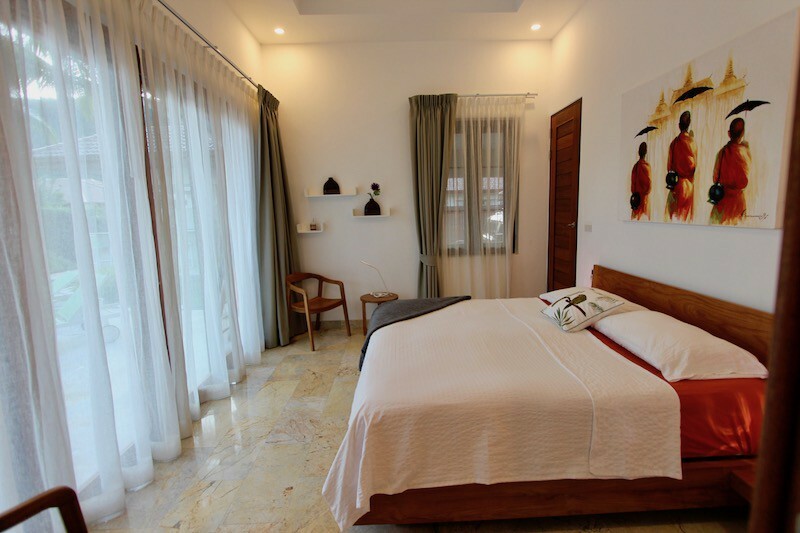 Also in the main house is a media room and 2 full size bedrooms, each with en suite bathrooms. 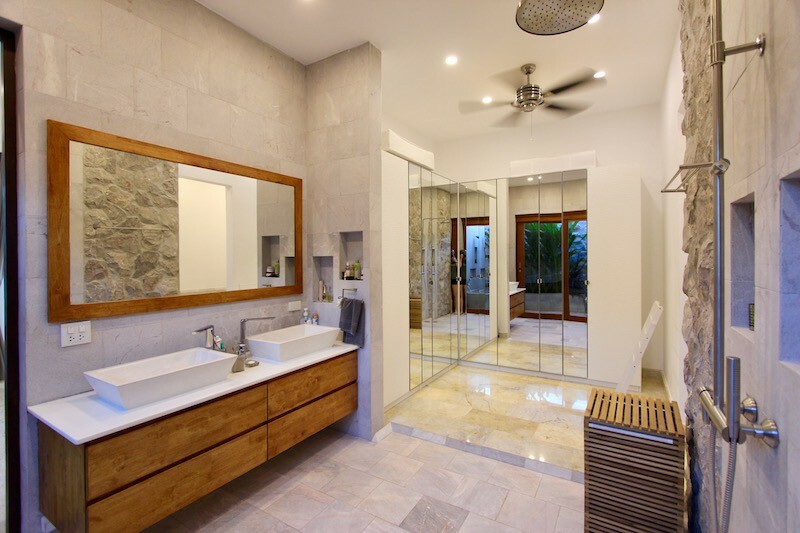 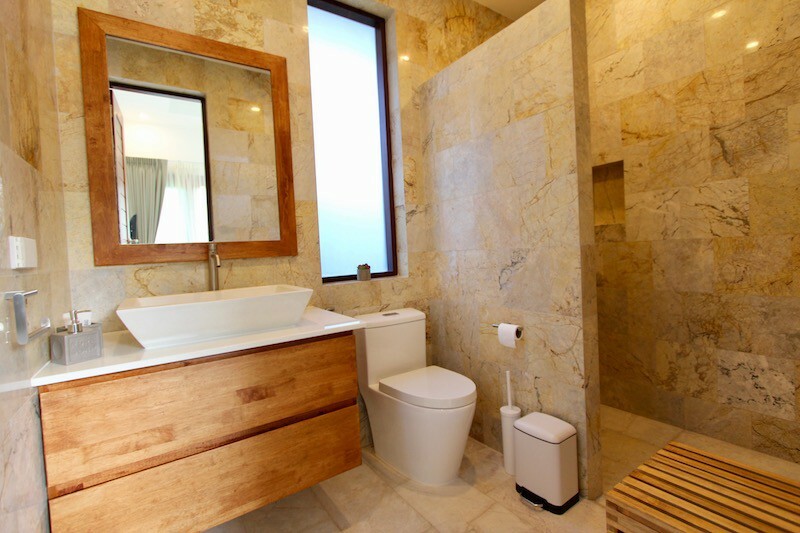 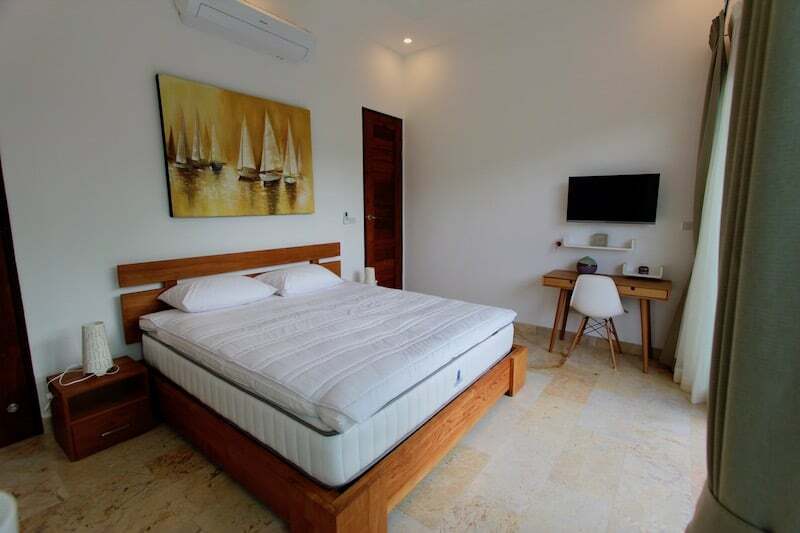 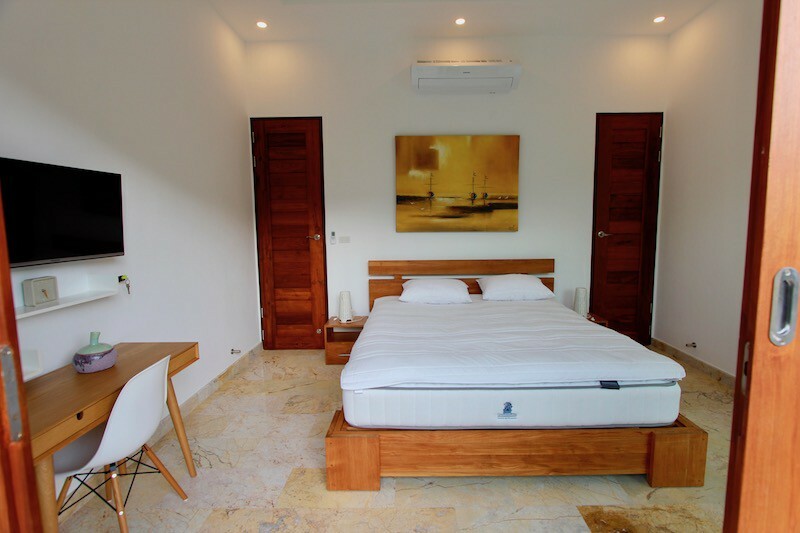 The master bedroom features a beautiful walk-in closet, large bathroom plus an outdoor garden bathtub and shower. 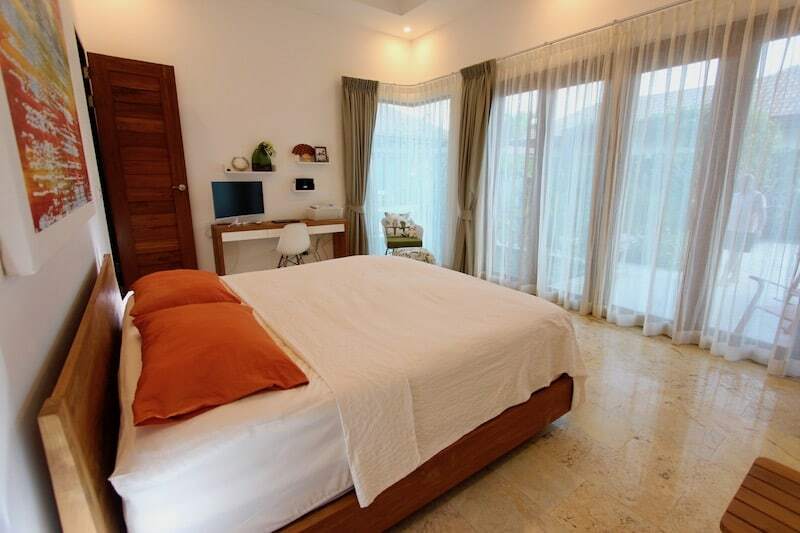 Off of the master bedroom is a charming pond full of plants and fish, providing a perfect morning and evening view from the floor-to-ceiling corner glass windows. 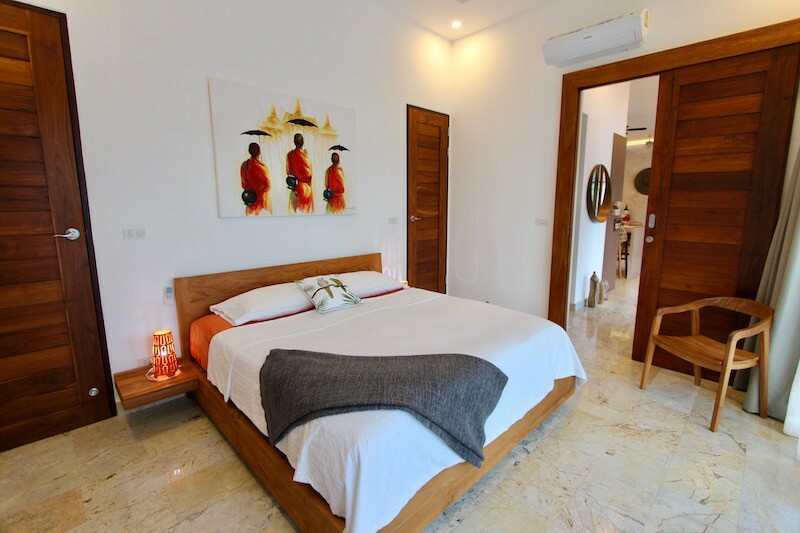 There is a large, separate guest house with 2 bedrooms, each with en-suite bathrooms, a fitness room, and a private terrace. 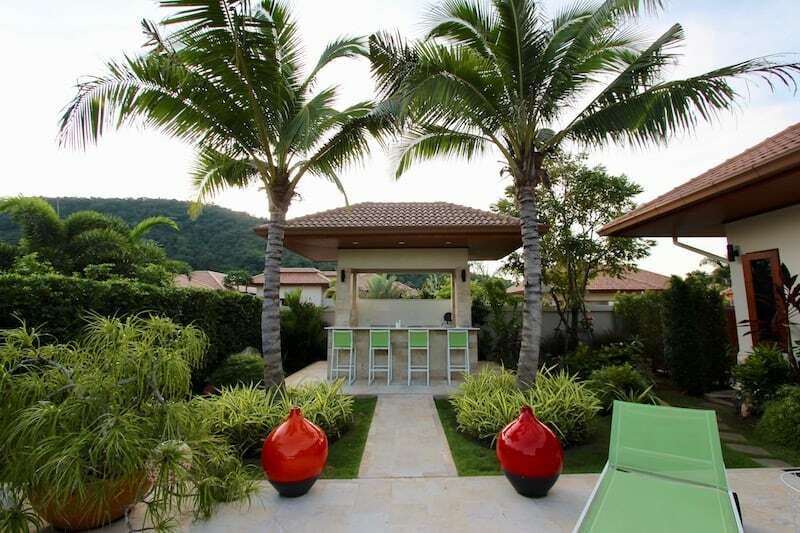 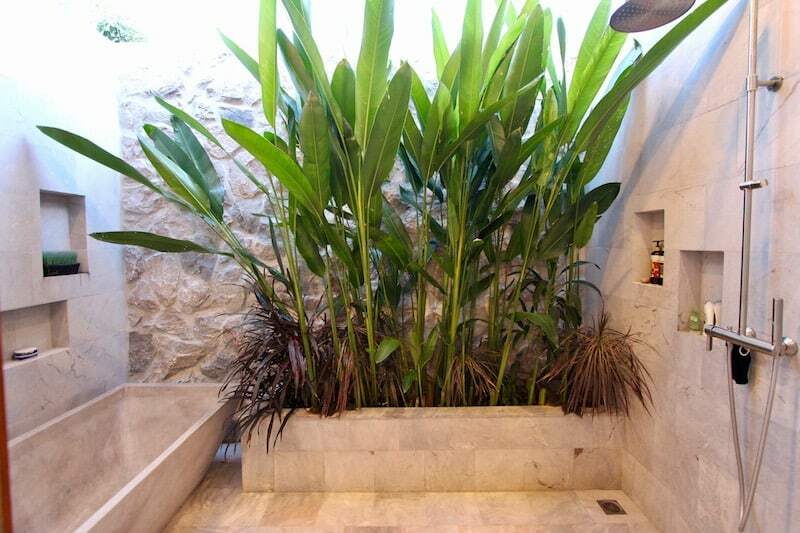 The garden is lush and tropical, though easy to maintain. 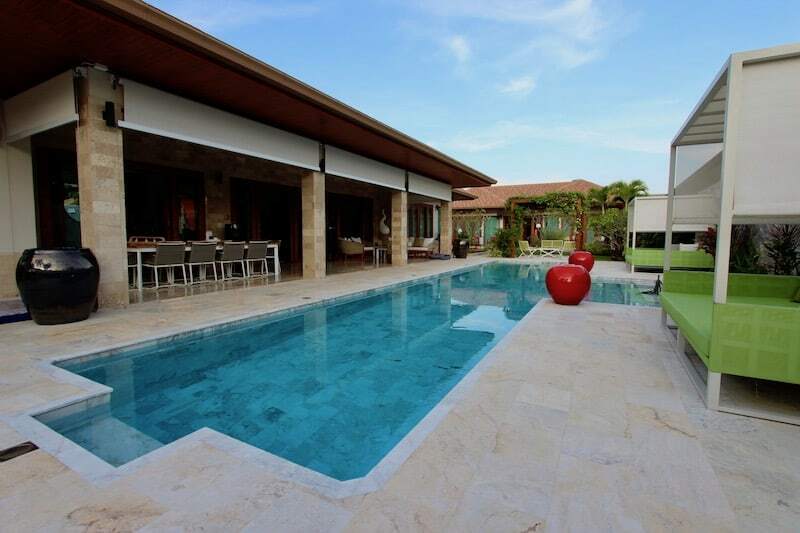 The long swimming pool (14 m x 3 m) perfectly frames the outdoor covered terrace, and is fantastic for swimming laps. 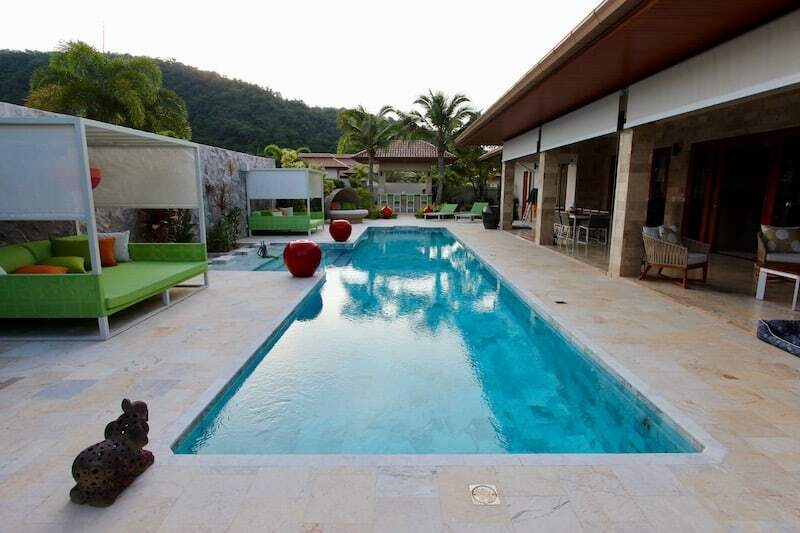 The swimming pool is tiled with natural white marble, giving the color a cool, glacial blue that is incredibly inviting. 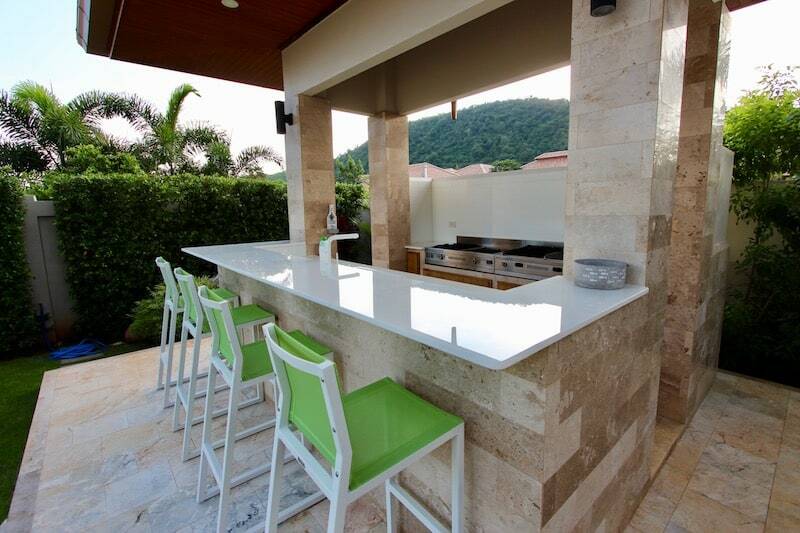 The BBQ kitchen is fully equipped with a beverage fridge, sink, large grill, stir-fry wok and burner. 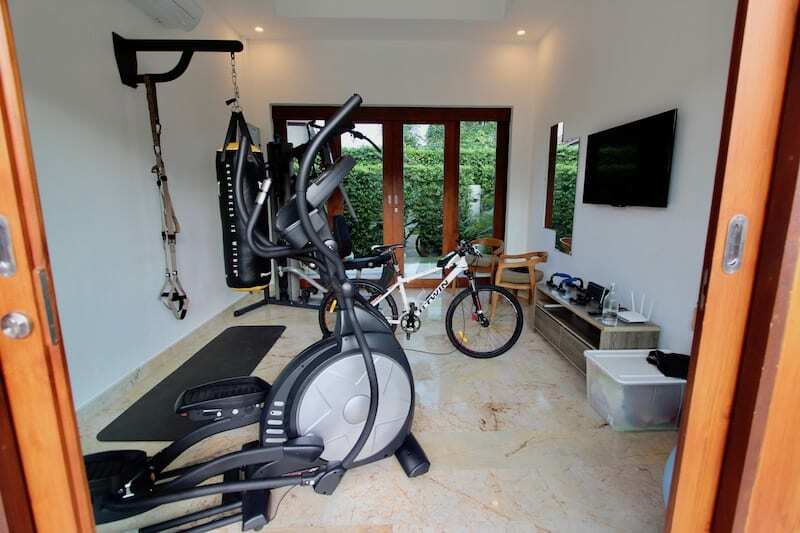 The home is equipped with a separate storage room, a laundry room, a covered carport, motorized entrance gate, and a privacy wall surrounding the property. 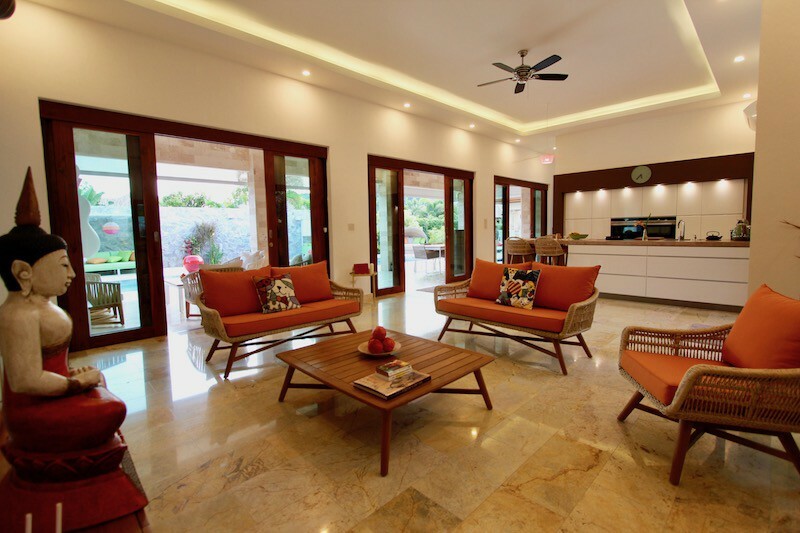 The home is sold fully furnished with gorgeous, luxury furnishings. 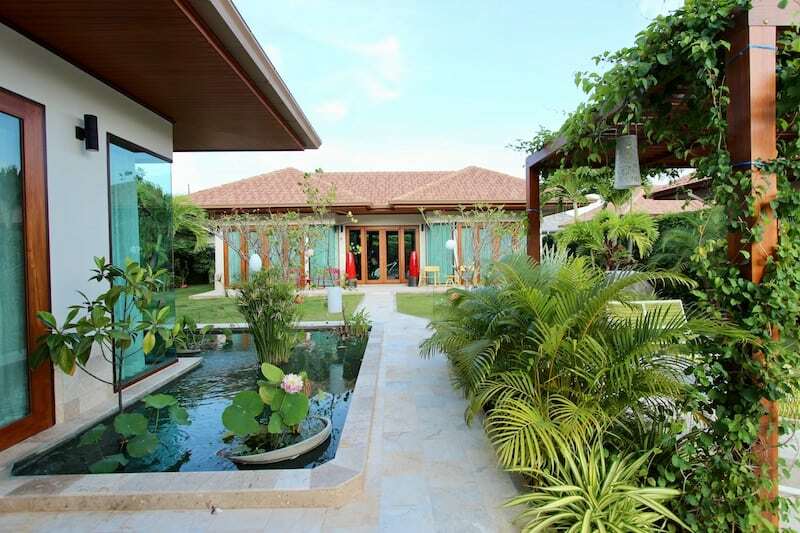 This is a fantastic value and a great option for potential buyers considering investing in Hua Hin real estate. 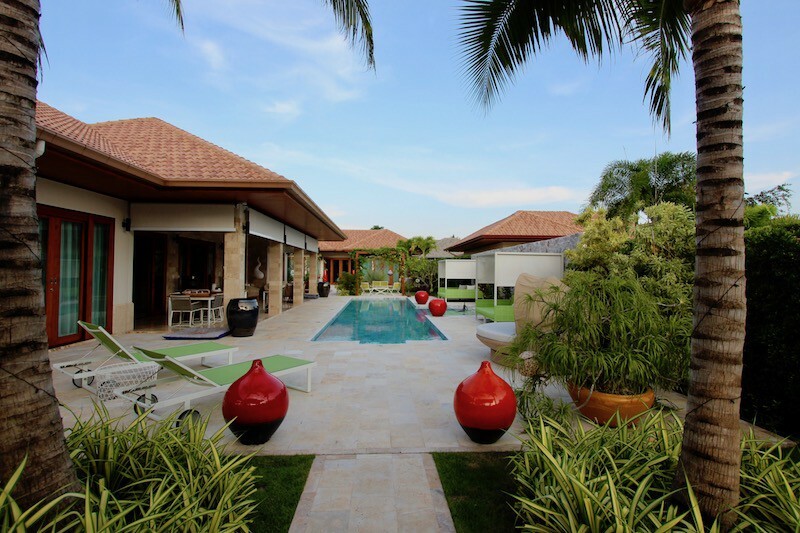 For more information on Hua Hin real estate and this Khao Kalok home for sale, please contact Executive Homes Hua Hin at +66(0)85.264.2158.